First off, don't buy the Laser for movies, DVDs are better quality at a High resolution. If you love playing with the remote and interactive capability of movies read on. That said, here is a rant of a certified OCD Laser Disc Collector. When the Home video were in VHS tape, a few other formats came out to for a better picture. Betamax Tape offered a record time shift capability but the size of the tape would not hold enough for a large movie. The VHS can hold 6 hours in EP mode but the video quality deteriorated. CED discs were read by a stylus, similiar to a record player. It offered a superior picture compared to tape but the disc would wear and skip after a few plays. Then there was Laser Disc known to videophiles as the best format for home video. This came out years before the music CD and DVD was not invented yet. 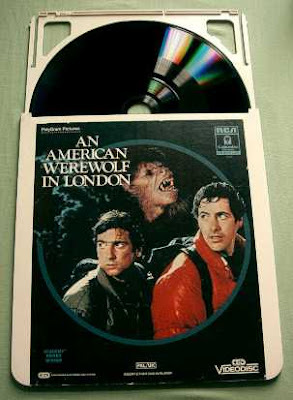 A limited market due to no recording capability, the Laser Disc offered the best picture and sound quality in its day. The earlier Laser Discs were in CAV mode which offered slow motion and pause on the earlier laser disc players. No more blurry jumping imagery while scanning or pausing compared to Tape, but each disc could only hold 30 minutes of crystal clear video per side. 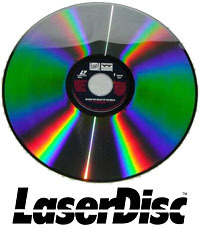 Most laser disc are produced in CLV mode with one hour per side. The earlier players could no longer slow motion or pause a frame. Newer players offered Digital Freeze for the CLV format which also allowed the return of crystal clear slow motion and pause to find a frame. A Flip feature plays both sides of Laser disc without ejecting by moving the read head to the opposite side. The older CAV format which are mainly Criterion had plenty of extras and crystal clear freeze and step. A very rare failed format were the gold CD-Video discs. I have three; Dire Straits, Level 42, and Moody Blues. Music CD and a Laser Disc video track. The idea was music for the car and a bonus hit MTV Video for the home on one disc. Kinda ingenious how both were incorporated on that one disc. Music Video can be found on standard twelve Inch as well as a more compact eight inch Laser Discs. Laser Disc players support three sizes. 12" Laser Discs - 8" Laser Discs - 5" CD and CD Video discs. Laser Discs are region free and more importantly macro-vision free. NTSC or PAL are the basic two incompatibilities. You can't display both modes unless your TV can support both mode. Japanese discs which are NTSC will play fine on a U.S. player. For a real kick get the Japanese version of Planet of the Apes. Apes talking in Japanese a riot! 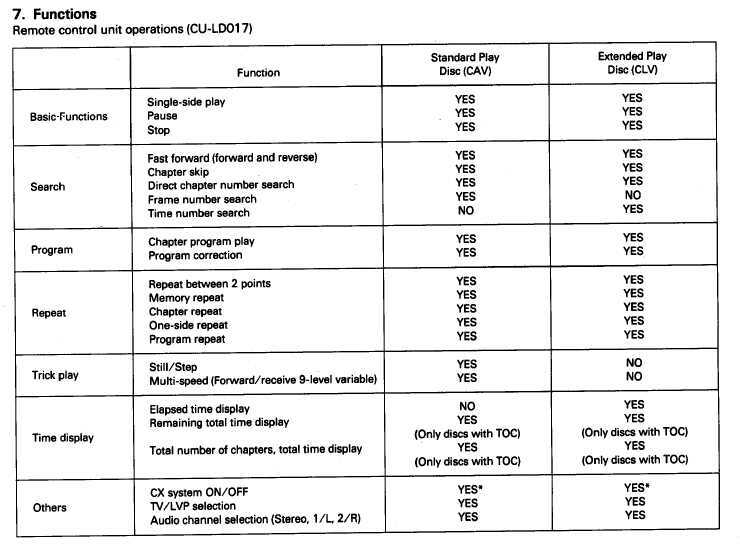 CX noise reduction, later discs had Digital Audio and THX sound. Multiple Language, Sound Track option only on some Criterion Discs. That Sound track option lets you watch the entire movie with just music Sound track, puts a different perspective (Deniro Taxi Driver). Then there's all the Karaoke discs. The CX (CX stood for Compatible eXpansion) Noise Reduction System was added to the LaserVision format in 1982. Due to the way LD's are encoded, the right channel FM audio carrier is too close to the video carrier. With high level/high frequency audio or very bright scenes, these signals may overlap and interfere with each other causing audio distortion and on-screen 'beats'. In addition, the FM recording system used for the audio was suceptable to noise picked up from less-than-perfect pressing techniques. Pioneer looked for a way to reduce the interference and noise without having to change the system specifications. Both Dolby C type noise reduction and DBX Type II were submitted, but compatibility concerns (not to mention royalty rates) lead Pioneer to adopt CBS Lab's CX (Compatible Expansion) Noise Reduction System. Originally developed for LP's, the CX system was a 2:1 compressor/expander that worked somewhat like the Dolby and DBX systems but was designed for relatively quiet media. Another design goal for CX was that encoded recordings wouldn't sound noticably 'compressed' when played back without decoding. For LP's, CX provided 20db of noise reduction, but Pioneer changed the system slightly for better sound quality when UN-decoded, thus reducing the noise reduction to 14db. Unfortunately, Pioneer completely botched the CX system. Titles would be listed in catalogs as CX, but were not, titles without a CX mark WERE CX, and many titles didn't receive encoding at all. LaserVision fans begged studio's and Pioneer to CX every disc, but Pioneer refused. All Pioneer had to do was flip a switch during mastering, but they didn't. They wouldn't even tell studio's that CX was available. The studio had to specifically request it. This sad state of affairs would be repeated when digital sound was introduced. CX Noise Reduction allowed tube-based players to achieve an audio signal-to-noise ratio of up to 72db (assuming a perfect pressing) with a dynamic range of 80db. Later solid-state players achieved a S/N of over 80db. As a side-note, it's really too bad that Pioneer didn't adopt the dbx-II system as this would have provided up to 40db of noise-reduction and allowed a substantial increase in high-frequency headroom. 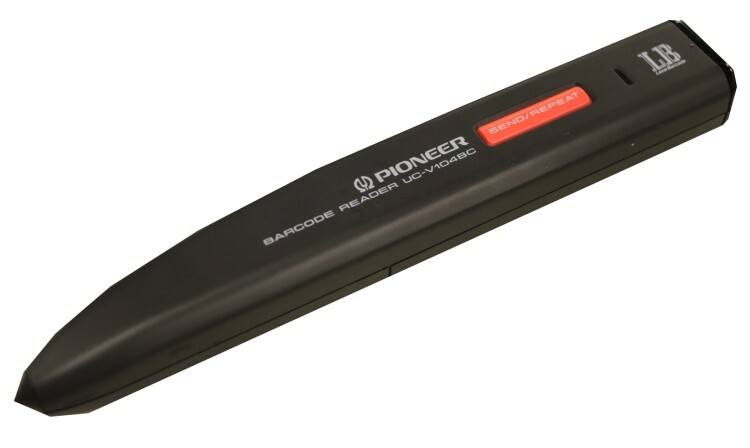 Pioneer's compatibility concerns were not really valid since there wern't that many early players in use - and with low-cost dbx decoder's available, any owner of an early LV player could upgrade to dbx for less than $60 since standard tape/LP dbx decoders would be 100% compatible with LV's use of the system. 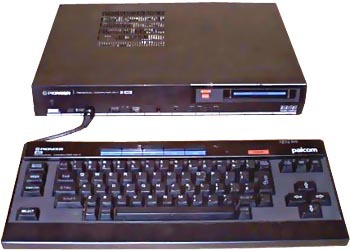 Shown above is the only out-board CX decoder produced for LaserVision discs. Since CX had to be precisely calibrated for each players audio output, the decoder had a switch on the back to adjust it to work with the various players available, such as the VP-1000, the industrial 7820 and the Magnavox 8000 series players. The decoder wasn't widely available, many dealers not even stocking it; in fact, we never even saw it in stores. A really great feature of laser disc players is a lot of them came with a Jog Shuttle Dial on both the Remote and on the Laser Player. I have Jog Shuttle on my VHS and one of my DVD players too. This forgotten gem really works well on the Laser Disc. Compared to jerky reverse of DVD, Laser Players have very smooth frame by frame, slow up to 32x speed forward and smooth reverse. You control the throttle for a rock solid scan! Separate step frame is also slick. Center part of JOG dial allows tight control frame by frame forward or reverse. Outer Shuttle Ring is the scan forward and reverse slow to fast. The interactive control of a Laser Disc has never been repeated on consumer DVD players. The forgotten JOG-SHUTTLE DIAL with FRAME SEARCH (Not TV channel) NUMBER BUTTONS. Looky all the Videophile buttons you won't find on DVD. Buttons and knobs require something connected to them behind the front panel and manufacturers began, in the early 1980s, to eliminate the linkage, solenoids, relays, and anything else that required human interaction on the assembly line. I was told that the concept of the jog/shuttle wheel was originally to allow for centralized transport function control in professional video editing machines. The feature found it's way into the upper echelon of consumer VCRs during the late 80s, then became all but extinct as DVD took over. No that is not a volume control but the beloved forgotten JOG SHUTTLE DIAL. This player has a separate CD tray. Only seen on Laser disc, yet to be exploited on DVD. My Space Archive disc has Tons of Satellite imagery all over the world. I can find a specific image by keying in the exact frame number from a reference booklet. 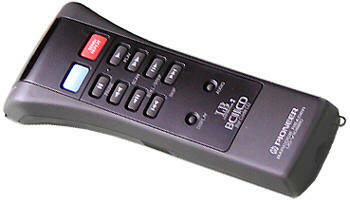 The remote pictured below is not channel select but numbers to key in an individual frame of disc! The video sequence of the Space Shuttle landing with Tangerine Dream Music puts you there! 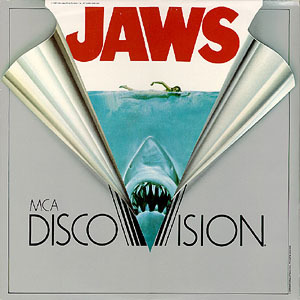 A sign of the late 70's when Laser came out, MCA discs were called Discovision. God, I hate Polyester! Just like LPs of the day, plenty of room for artwork and by-fold for extra liner notes. Criterion started out on Laser Disc. The production company known for the best of the best version of a given movie with cleaned up prints and a huge amount of extra features. Early Laser Arcade game animation graphics such as Dragon's Lair far exceeded Raster and Vector games of the day. The animation itself cannot be controlled, just which video section of the disc to display. A tradeoff of limited Gameplay requiring a timed bump of the stick or press of the fire button. This would chapter search a winning or losing video segment. Newer Laser Disc games such as Astron Belt and Fire Fox combined both the Laser Disc and Arcade PCB graphics. There are Home Laser Video game players with dedicated Home Laser based games such as the Palcom series and the Sega Laser Active that played Laser Discs, Sega and Turbo GraFX games. The Palcom series combined background video off the Laser Disc with game graphics produced by the player and even replicated Laser Arcade games of the day. Pioneer also sold the ER-101 interface (Laser Vision) unit which made it possible for all MSX computers to have the same functionalities as the Palcom PX-7. Pioneer Laser Active with Sega Genesis and Turbo GraFX 16 Module PACs. There is even a Bar code remote for some Laser Disc Players. Mainly used for class rooms or industrial markets. Scan a bar code from a specialized instruction guide. A simple way to search out a given chapter. The players also have a RS-232C interface in the back for external control from a PC, Mac or an Arcade game such as Dragons Lair. A Laser Disc DVD Combo player is an expensive collectors item but not cost effective. The big plus is it does have Component output, but only when playing a DVD. The Laser video will not be in 480p. More importantly, if it breaks, you are out two formats, well three if you count the CD player. With DVD upscalers so cheap now, it is better to buy a separate dedicated Laser Disc player that has both double sided play and digital freeze. The story with laser disc isn't so clear. The laser disc signal is recorded in composite video form, and there is no such thing as a Component video connection on a laserdisc player (the Component outputs on LD/DVD combi players only work for the DVD portion). Naturally you'd think that S-video is your best bet if the player has an output for it. Not so fast. It doesn't work that way in the composite video realm. Sometimes the Composite connection is better. In fact, a lot of times the Composite connection is better. Your choice of S-video or Composite cable is dependent on which piece of equipment has the better comb filter built-in, the LD player or your TV. If your LD player has the better comb filter, use the S-video output. If your TV has the better comb filter, use the Composite output. The sad fact is that the comb filters built into most laserdisc players are really crappy by modern standards. The best type of filter is a 3D comb filter, which is only found in the top-of-the-line Pioneer Elite CLD-99 and a handful of the really exotic Japanese import machines. The 3-line 2D comb filter found in some of the other high end machines such as the CLD-D704 and Elite CLD-79 are decent but not great. Any kind of 2-line filter found in the mid-range LD players is going to be garbage. If you have a modern HDTV, odds are good that it may have a quality 3D comb filter built-in. If so, Composite Video is the connection type you want to use for laserdisc. If you aren't sure what type of filter your TV uses, try both cables and see which looks better. It could go either way. The Snell & Wilcox zone plate test pattern on Video Essentials is a good starting point to see which comb filter produces the worst artifacts. Laser Rot? It does happen on some discs, even my Criterion Blade Runner movie has this problem. Laser Rot were also another hot issue where coolant trapped in the glue would corrode the reflective pits inside the two halves of a Laser disc. The internal corrosion from moisture in the glue during the manufacturing process. Many early LDs were not manufactured properly; sometimes a substandard adhesive was used to sandwich together the two sides of the disc. The adhesive contained impurities that were able to penetrate the lacquer seal layer and chemically attack the metalized reflective aluminium layer, causing it to oxidize and lose its reflective characteristics. This was a problem that was coined "laser rot" (or, "LaserRot", after the original official CamelCase "LaserDisc" name of the underlying product) among LD enthusiasts. Some forms of laser rot could appear as black spots that looked like mold or burned plastic which would cause the disc to skip and the movie to exhibit excessive speckling noise. But, for the most part, rotten discs may actually appear perfectly fine to the naked eye. Notice the purple and yellow dots on Sandra Bullock's face. As time goes by, the number of these dots will increase if the Laserdisc has Laser Rot. Even if stored correctly, sometimes the defects takes years to show up in the video with a grainy picture. Having owned Laser Discs for decades, one thing I noticed is that when the Laser Rot does appear it will peak and then stop. This all depends on how much moisture providing the catalyst for the cathode to anode corriosion process inside. The CED and VHD were two other formats that were confused with Laser Discs. Completely unrelated and uses a different technology. 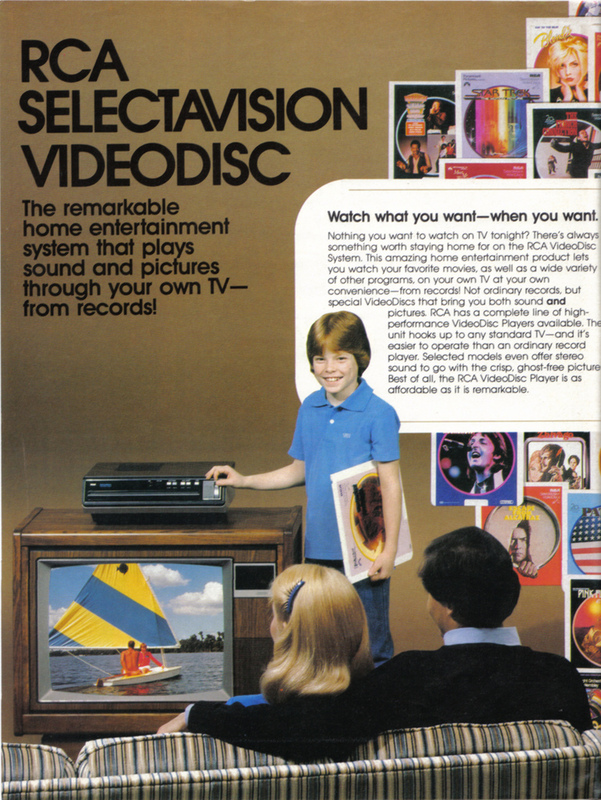 The CED disc was manufactured by RCA in America with SelectaVision players. This is different versus a Laser Disc which is read by a tracking eye. Due to risk of easily being damaged, the VHD and CED discs are protected inside a sleeved jacket. Sony PSP UMDs are also sleeved jackets decades later, but is read with a laser eye. A CED disc can be manually removed from its sleeve for verifying its condition. Looking at the end where the disc comes out, there is a plastic lock tab on each side. While pushing both tabs inwards slightly, the disc with inner holder can be slid out. Be very careful if you do this to avoid any scratches. Do not touch the read surface of the disc, any fingerprint oil would be difficult to remove off the very fine "grooves" of the fragile vinyl CED disc. Note that the disc can be inserted upside down. Not an issue, either side of the sleeve can be used and reversed when inserted into the player. So are Laser Discs a good choice for watching movies? It depends on what you want to get out of it. Is DVD Better Than Laser Disc? Laser Discs offer true full-bandwidth uncompressed, uncopyguarded video. When used with an analog video line doubler and data- grade video display, a good laser disc can easily outperform it's (unprocessed) DVD counterpart. Also, NTSC Laser Discs purchased anywhere in the world can be played on any NTSC standard Laser Disc player. Laser Discs recorded in 16 bit digital matrix surround usually sound better than many DVDs that only contain Dolby-Digital 5.1 or compressed 2-channel audio. Laser Disc jacket art is without equal. The 12" size allows for larger print, complete liner notes, and really enjoyable album cover art. Laser Discs are "hard encoded" in NTSC video. Even though many LV players have S-video outputs, all laser discs, exhibit a characteristic "crosshatch" distortion caused by the NTSC color subcarrier. This is most noticeable in small text, where the letters seem to be "floating" amidst background of moving fine-grain diagonal mesh. Since all NTSC broadcasts have the same distortion, many Laser Disc owners don't notice the distortion until they compare it with component video or true S-video. 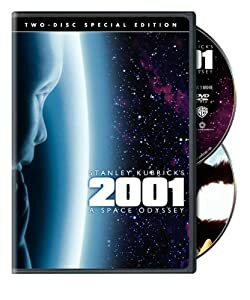 I took a look at three versions of a Stanley Kubrick movie, 2001 Space Odessey. Laser Disc CAV box version by Criterion, DVDs by MGM and Warner. Okay I am an absolute nut, bought three different versions of this movie within a couple of days of each other. Already owned older pressings of the movie on MGM Laser and Kubrick Collection DVD. Each version has extra footage worth getting. Weird that the older MGM DVD cost a slightly more at BookOff, but it is out of print and contains a nice booklet inside. The highlight is finally aquiring the beautiful Criterion CAV Laser Disc 6 Sided Box Set. That last side has all kinds of extras, lost footage of Arthur C Clarke in the NASA Clean Room and reams of pages to read that have not reappeared in the newer DVDs or even Blueray discs. First a comparison of the two DVDs, click the link in the quote below for a very thorough detail of each including comparison screenshots. The MGM images are faded and dull in comparison to the Warner. Color was extremely important to Stanley Kubrick and it is easy to identify the darker MGM's as being fallible. I also zoomed in to find a touch of edge enhancement on the MGM. The MGM is a shade horizontally stretched as well. Contrast is superior on the Warner. The MGM has some visible damage spots, dust and scratches. The MGM is cropped on top, right and left edges. Each DVD has extra features that are unique to each pressing. This makes it harder in which version to get, for instance the Arthur C Clark interview on the MGM versus the extra options and the better Anamorphic pressing of the Warner DVD. Even the 8 page booklet only available on the older MGM DVD is notable. I ended up getting both DVDs as well as the Laser Disc. The CAV Criterion Laser has so much extras that is not availabe on DVDs. The movie is a rougher image and not Anamorphic, but it is the interactivity that makes the Laser Disc shine. Side 6 is the disc to see for the nice supplementals. • Arthur C. Clarke discussing the future of space exploration. Although not 480p capable, you cannot beat CAV frame by frame study of a movie. The document scans are huge, reams of pages that will take hours to read. I found the gravity free toilet instructions particularly interesting since the movie only shows a glimpse of it. In addition and only on Laser, is the extensive NASA footage with Clarke narrating which shows the accuracy of the 2001 movie. Footage lost and not included fully on the DVD or Blueray discs. The Criterion transfer was done under the supervision of Stanley Kubrick, so you figure its gotta be good. However, while watching this I did an a/b comparison of the laserdisc and the DVD, running them simultaneously. The DVD colors seemed much clearer and sharper. The image quality was free from any kind of dirt or grain, while the Criterion transfer sometimes looked a little too red or washed out even in some spots. There were a few blemishes on the print that were not evident on the MGM DVD. I think when I watch the film, I will watch the DVD (besides, no side flips). The print is shown in the original aspect ratio, which is the only way this ought to be viewed. While the transfer may be a little lacking, the supplemental section is unbeatable. It begins with an extensive still-frame reading section. The supplement directory is included on a separate card in the box complete with both chapter markings and frame markings, in case you actually feel the need to take a break before the end of the chapter (Don't feel bad, most people will. Us psychotics will continue till the end.) The first chapter of supplements is written by Arthur C. Clarke. He gives a very detailed account of how he came to work with Kubrick on this project. Also included is the original short story called 'The Sentinel' (yes, dad, I remember when you originally xeroxed this (catch the pun?) for me and told me this is where the idea came from.) There are also excerpts from an interview with Clarke talking about the story and the film. 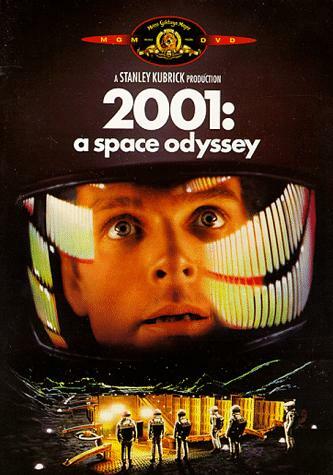 '2001' was originally supposed to have a prologue featuring interviews with various scientists. They were going to discuss the potential for extra-terrestrial intelligence and the validity of the ideas presented in the film. Needless to say, those ideas were never used. However, thanks to Criterion, interviews with a wide range of scientists (and even a couple non-scientists) are preserved for your still-frame viewing pleasure. The next chapter is a hypothesis about 2001 by Gregory Benford. A synopsis here is not necessary but it was definitely interesting. Next comes the 2001 retrospective by Fredrick Ordway III. My favorite part of this retrospective was the zero-gravity toilet instructions. You can actually see what Dr. Floyd is reading when he is trying to decide if he can hold it or not. There are documents regarding the type of rockets that would be necessary to propel a ship such as the Discovery and how they would be constructed. Basically it covers an extensive range of materials that were given to Kubrick in an attempt to help him make an accurate representation of space travel. Next stop, Jupiter and beyond the infinite. Well, not really. I mean, if I could do that I would never go to work. But I can learn all about the slit-scan technique used for the stargate sequence. After that, I can watch some computer-generated movies of the Voyager I and II flybys of Jupiter. Not only do these five minute films have narration, but they also have a commentary track about how they were made and how they used the data that were sent back from the probes to construct a model of what they saw. Finally, something that I vaguely referenced about a year and a half ago. Remember when you started reading this? Yeah, that's what I'm talking about. There is a section called art and reality: a montage. It shows clips from 2001 followed by real-life counterparts to what happens in the film. Its kinda scary how accurate Kubrick's vision was, especially since most of this stuff wasn't even scheduled to happen when he shot '2001'. Bottom line: if you have a laserdisc player, a love of this film, and a chance to grab this box set, do NOT hesitate at the moment of truth. You will not be disappointed. 1. For the best movie experience, the two disc 2001 Space Odyssey Warner DVD is definitely the way to go. It has Anamorphic 480p and really is crystal clear. On a very large HDTV, BlueRay would be even better, due to a higher resolution. 2. For the extra footage, all the discs have unique extras and all worth diving thru. 3. For full interactivity and a huge library of documents to read, the Laser Disc 2001 Space Odyssey Criterion is amazing, by far the best. The video footage of Arthur C Clarke at the NASA Clean Room is especially worth a look. Interesting how much research and accuracy was put into the movie. 4. Watch the movie on DVD - Play with the extras on all three, especially the Laser Disc. I'm a Laser Disc junkie since buying the Pioneer LD-660 (No Remote capability) top loader new and the LD-1100 used. First movie I bought was CLV Empire Strikes Back. For its day (DVDs not out yet) any videophile would drool at Laser Disc quality. Blew VHS away! I own two Flippers as well, Pioneer CLD-D702 and the CLD-3070. 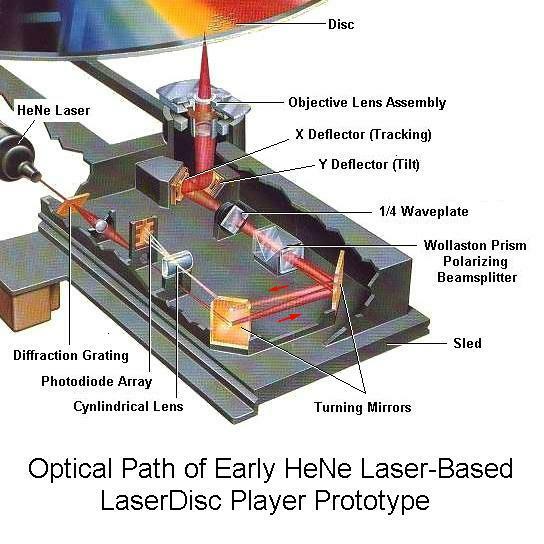 When the newer laser models came out (similar to audiophile heated debates of LP vs CD) there were strong arguments between which were better, the originals with the larger gas filled laser vs the later chip lasers. In addition to Laser Players I also own a SelectaVision Player model number RCA SGT200 along with a stack of CED movies and documentaries. The cover on the top opens to allow access to the Stylus. Any format is worth collecting, there are some CED discs that never made it to DVD. Last edited by CRTGAMER on Mon May 09, 2016 6:41 pm, edited 134 times in total. CRTGAMER wrote: First off, don't buy the Laser for movies, DVDs are better quality at a High resolution. I know you mention one of the movies in your in-depth response, but it's worth mentioning that Laserdisc is still the best format to get the pre-1997 Star Wars Trilogy in. It's not likely that Lucas will ever release his untampered trilogy to DVD or Blu-Ray. What dedicated Laser Video Game Players are there? wado02 wrote: What dedicated Laser Video Game Players are there? The ones that have RS-232C interface. I added information on Bar Code remotes above. Last edited by CRTGAMER on Thu Apr 07, 2011 11:29 pm, edited 1 time in total. Jamisonia wrote: What happened to your laserdisc guide? I just found a Pioneer Laserdisc player LD-870 I think at a thrift store and picked it up. The biggest thing that confuses me is how the audio works on the varying laserdiscs. I know mine doesn't have to link or that weird AC3 UHF out thing, but I'm confused as to the repercussions of not having that. The link is for computer control. Just hook up the regular RCA audio connections. Unfortunately this player doesn't look to have a S-Video connection for video though. This player supports Digital sound. You can select Digital, Analog and different audio tracks depending on what is on a particular laser disc. Think of the Audio select menu on a DVD menu, but with the Laser Disc you change audio tracks while playing the movie. The CX button, similar to Dolby cuts the hiss on analog sound. I think your player has 1L and 2R buttons on the front panel. Thyese control the audio tracks. The Criterion Laser Discs really took advantage of this feature. Certain movies such as Taxi Driver have a dedicated music only track. I meant to say the player doesn't have toslink, so I don't think I can play DTS or digital PCM tracks, only the Analog stereo tracks. Is that correct? I have read that many of the analog tracks are terrible, and the digital pcm tracks are much better, additionally I've read that if the LD contains an AC3 track, it forfeits the Right Analog track, so a player like mine will just play garbage out of the Right speaker. I'm wondering, firstly is that true, and if so, how many movies could potentially present that issue? Jamisonia wrote: I meant to say the player doesn't have toslink, so I don't think I can play DTS or digital PCM tracks, only the Analog stereo tracks. Is that correct? I have read that many of the analog tracks are terrible, and the digital pcm tracks are much better, additionally I've read that if the LD contains an AC3 track, it forfeits the Right Analog track, so a player like mine will just play garbage out of the Right speaker. I'm wondering, firstly is that true, and if so, how many movies could potentially present that issue? Oh, the optical audio out. No worries the Laser Discs that have that coding also have Digital Sound, your player should support that. I didn't know about that coding taking away one of the analog tracks, never noticed since I don't use the top loader anymore. oh the LD player can turn the digital pcm tracks into analog and send them through the Red and White audio ports like a DVD player does with its digital tracks? I haven't been able to try that because my LD player doesn't have the remote. There's no audio button on it, but the remote is one its way. Can you post a pic of the front and back? 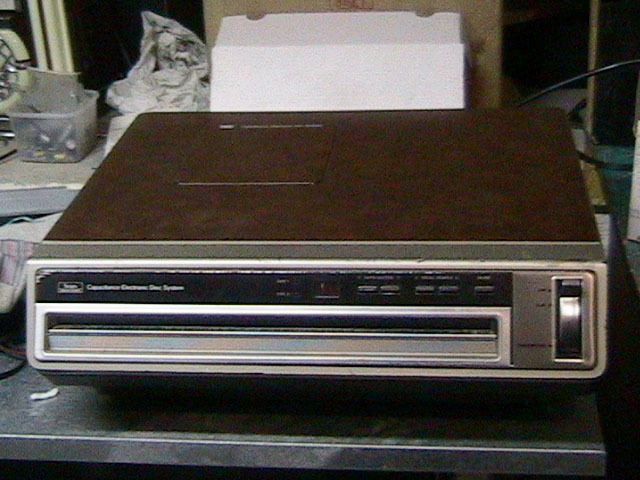 I found a pic of your Laser Disc Player with a matched remote but the buttons are not clear on the player. Oh crap, from looking at the vintage of the remote maybe your player doesn't support digital sound. The way the 1L and 2R works is if only one is selected the sound still goes to both speakers. Usually each channel is a language track but in this case if the DTS is one and then Analog Mono will be the other. Then there are two other tracks, those will be Digital Stereo, but only on players that support Digital Sound. But the worse part is there is no Jog Shuttle wheel which is the best feature of rock solid control scan of laser disc players. You can still get smooth scanning but will be tapping the buttons instead. Look over the Guide on the first page for some other features unique to laser discs. Use the player for unique discs such as the Space Archive individual frame packed pics or an out of print video. I would not buy a Laser Disc movie today if there is a DVD version which has a better pic. For Digital sound, usually there is a red framed icon on the player screen. Last edited by CRTGAMER on Fri Apr 19, 2013 6:56 pm, edited 1 time in total. CRTGAMER wrote: Can you post a pic of the front and back? i just got into collecting ld.. and the first thing i noticed was the sound..it was amazing...anyways i came across some boxsets.. trades anyone, looking for(the warriors,colors,pulp fiction,hip hop lds etc..